Don&apos;t miss an opportunity to own a charming bay side bungalow. Blue Bungalow by the Bay is located three very short blocks to the fabulous beaches of North Cape May. From the front of the house you can see the spectacular sunsets over the bay a short distance away. This home dates circa 1923. This special two story home has a unique character unparalleled by other bay area properties. The exterior of the home conjures images of a fairy tale cottage. The interior boasts solid hardwood flooring found exclusively in period homes along with many modern amenities and upgrades. There is a large and inviting kitchen and dining area. There is ample wood cabinetry, a quartz counter top and stainless steel appliances. The living room offers a cozy stone faced wood burning fireplace. There is a choice of a master bedroom on the first or the second floor and a family room off of the kitchen-dining area. The first floor bathroom offers a toilet, vanity and full ceramic tiled shower with a sleek glass enclosure and a rainfall shower head. The second floor offers two bedrooms with walk in closets and a powder room. The upstairs bath can be expanded to add a bath tub. The first floor family room can easily be converted back to a fourth bedroom and the detached cottage a fifth bedroom as previously used in the past. There is a central air and heat split unit system on the first floor of the home and window and free standing air conditioners on the second floor. The whole house is heated with a natural gas baseboard hot water system. There is a an electric heat pump back up. There is a large walk down basement with access from the inside of the home as well as the outside. The washer and dryer along with mechanicals are located here. The dry basement offers extra storage space. There is a detached cottage at the rear of the property. The cottage hosts an additional sleeping area/hideaway room with electric and a separate storage shed/workshop. Right off the side deck is a an outdoor enclosed hot and cold shower and a concrete patio area for outdoor dining. Mature landscaping and fencing shields the home from surrounding properties. There is off street parking for three vehicles. 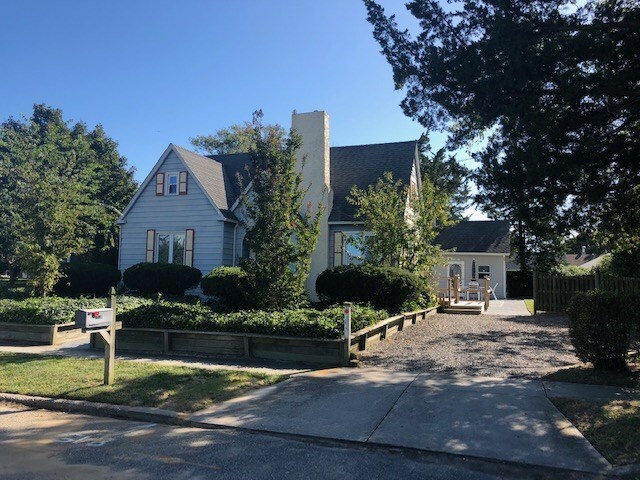 This is an ideal location only nine houses to the bay for a seasonal rental or second home use near Harpoon&apos;s and the Cape May-Lewes ferry terminal where you enjoy a bite to eat and the free concerts held weekly all summer. There is proven rental history. The house is selling mostly furnished for a turn key income producer. This home and the grounds are meticulous! This is NOT a flood zone. Don&apos;t miss out! Come check out this amazing property!!! !